Our certified packing experts utilize state-of-the-art packing and custom crating processes to protect your StingRay Parts Washer during transport. Our specialized knowledge and developed experience allows us to ensure StingRay machinery is delivered safely to destinations around the world. StingRay provides World Class wooden crating and corrosion inhibited packaging of parts washer for international cargo. StingRay durable wood crates are made with export-compliant wood and stamped with the internationally recognized ISPM-15 certified materials stamp. ISPM-15 is an International Standard that describes the measures to treat raw wood packaging used to ship products between countries. Its purpose is to prevent the international transport and spread of disease and insects. Stingray wooded crates are properly engineered to withstand the rigors of transport and designed for easy handling while protecting your StingRay parts washer from damage and corrosion. 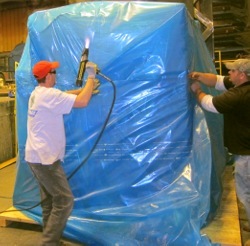 StingRay Parts Washer Crate Handling and Hoisting Recommendations. Stingray takes extra care with shipments destined for ocean freight. Our corrosion protection process starts with a sprayed on water soluble corrosion inhibitor barrier coat on all un-painted surfaces. Five pound bags of desiccant are strategically located inside the cabinet to reduce and absorb moisture. Desiccant bags are also placed inside the electrical control panel. Next, the entire machine is wrapped in thick, flexible shrink VCI film and the film is sealed with a heat gun forming a totally sealed package. Stingray VCI heat shrink film packaging keeps out both air and moisture. Specialty VCI film is produced with corrosion inhibiting chemicals imbedded in the film. During use the film releases a corrosion inhibiting vapor to protect your StingRay machine from rust and corrosion. The VCI corrosion inhibiting vapors condense onto all surfaces of your parts washer and form a thin, uniform, and extremely effective corrosion inhibiting layer. This barrier is self-replenishing. The coverage is complete – all surfaces, crevices, cavities, and other inaccessible void areas receive total protection. 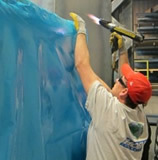 The vapor does not harm painted surfaces and leaves no messy oils to clean-up when the parts washer is opened for use.